1. In this study, the overall accuracy of ultrasound for diagnosing posterior ocular pathology was not high enough to support use in decision making. 2. Recognize that retinal tears can be misdiagnosed as posterior vitreous detachment on ultrasound. Missing a retinal tear or retinal detachment can lead to irreversible loss of vision (that sounds bad). Usually these can be diagnosed by a good look at the back of the eye. Unfortunately, often times dilated fundoscopy or ophthalmology consultation is not an option. Ultrasound can assist in these diagnoses. It has been used by ophthalmologists for a while and more recently emergency physicians. What we want to know is how accurate is ultrasound for each of the different pathologies we can diagnose? 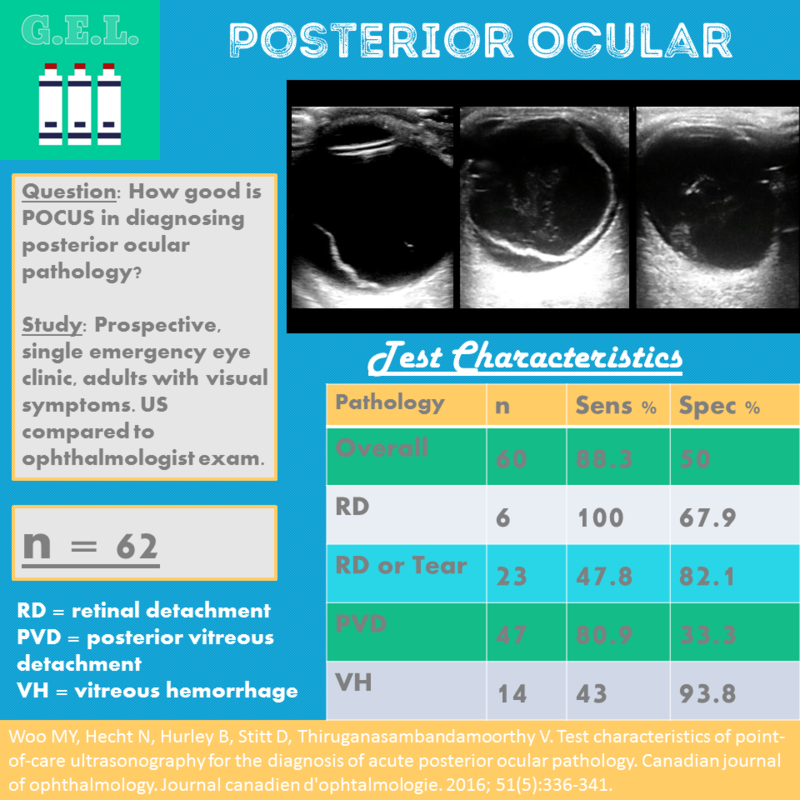 What are the test characteristics of POCUS in diagnosing retinal detachment, retinal tear, posterior vitreous detachment, and vitreous hemorrhage? Overall - low numbers, wide confidence intervals. It is somewhat surprising that some exams were more sensitive than specific (meaning they must have incorrectly diagnosed or over-called some findings. That is usually less common than missing positive exams in most ultrasound literature. Population was emergency eye clinic - more pathology than usual population (96.8% had pathology). Could this have contributed to more false negatives?